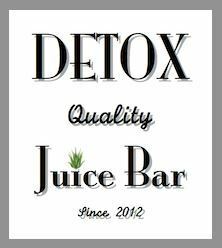 (detox) Detoxify with juices will strengthen your body’s immune system, eliminate toxins, cleanse and promote healthy cell division. Detox benefits include helping your body to fight off common colds, ease stress, reverse the effects of aging and even improve your energy levels. A build-up of toxins in your joints accumulate overtime; thus, a detox will improve joint pain and improve your muscle aches and pains. Headaches and migraines are sometimes indications of inflammation and or built-up toxins. A Detox has also shown to help weight loss. These are just some of the many reasons why you need to add juice to your daily diet to help your body Detox or sign up for one of our Detox Programs. Come by to see us and have a fresh squeezed juice, aloe vera or wheat grass shot on a regular basis. You will see the difference it can make. We offer daily Detox Programs for ฿1,000 per day.